CFP: Canons and Repertoires: Constructing the Visual Arts in the Hispanic World, Durham University, 20–21 June 2019, deadline 31 March! Specialists of Spanish arts, artistic communication and exchange, as well as experts of other regions are invited to discuss the role and definition of Spain in their own disciplines. Presentations may be delivered in English or Spanish. Please send paper titles and abstracts of no more than 250 words, together with a CV and 150-word biography, to Dr Edward Payne by 31 March 2019: edward.a.payne@durham.ac.uk. This entry was posted in Call for Papers and tagged art history, Call for Papers, Canon, Collecting, Conference, display, Durham University, Edward Payne, geography of art, historiography, Iberia, Latin American art, national representation, repertoire, Spanish Art, Visual arts, Visual Culture, Zurbarán Centre for Spanish and Latin American Art on March 19, 2019 by costanzabeltrami. This entry was posted in Call for Papers and tagged art history, Call for Papers, Canon, Collecting, Conference, display, Durham University, Edward Payne, geography of art, historiography, Iberia, Latin American art, national representation, repertoire, Spanish Art, Visual arts, Visual Culture, Zurbarán Centre for Spanish and Latin American Art on February 19, 2019 by costanzabeltrami. In recent years, meta-critical studies such as Ideologies of Hispanism (2005), Spain Beyond Spain (2005), Reading Iberia (2007), Un hispanismo para el siglo XXI (2011) and Iberian Modalities (2013) have sought to uncover the ideological discourses underlying Hispanic Studies and trace its historical evolution in order to elucidate how the discipline might or ought to evolve, if it is to remain relevant in a context in which national, linguistic and disciplinary boundaries have become problematized. The present volume, co-edited by Stuart Davis and Maite Usoz de la Fuente, seeks to contribute to this ongoing debate by considering how the work of PhD students and early career researchers in Hispanic Studies reflects and contributes to the expansion and the blurring of disciplinary limits. In a broad sense, the duty of every new generation of scholars in any arts and humanities discipline is to encourage a revision of the canon within that discipline and, in the process, to contribute to a redefinition of the discipline itself. This is an exciting enterprise, but it is not without its challenges and pitfalls. Amongst them is the question of how to attain visibility when working on a topic that is little known, or considered a niche area within one’s discipline, or how to position one’s work if undertaking inter- or multidisciplinary research that surpasses disciplinary boundaries. The aim of this book is to offer a useful overview of new research in Hispanic Studies by a selection of emerging scholars, and to reflect upon questions of canonicity, visibility and cultural capital, and the ways in which such notions span and contribute to shape our field of study. 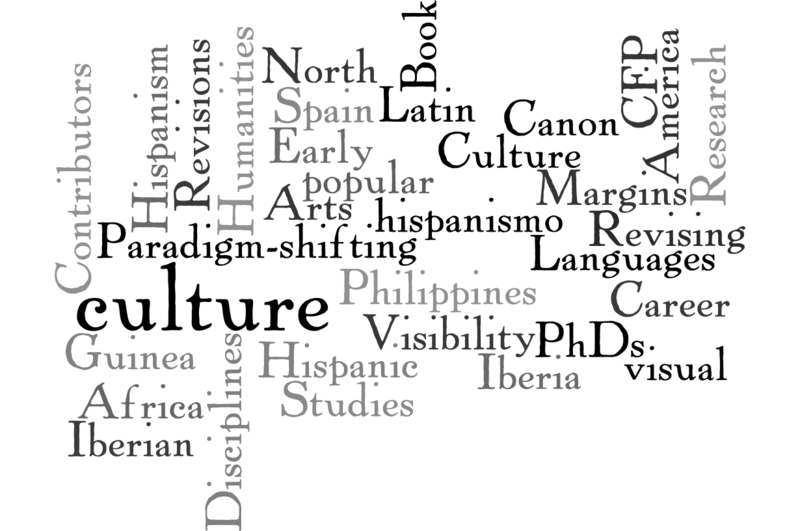 If you want to contribute to this volume, please send an abstract of no more than 300 words to hispanic.canon@gmail.com by 13 May 2015, accompanied by a short biography including your name, institutional affiliation and areas of research (2-3 lines). Selected contributors will be contacted by 30 May 2015 and the deadline for submission of essays will be 31 December 2015. This entry was posted in Call for Papers, Latin America, Spain, Spanish Art, Studies, Uncategorized and tagged Canon, CFP, Guinea, Hispanic Studies, Hispanism, hispanismo, Latin America, North Africa, Philippines, Popular Culture, Spain, Spanish, Spanish Art, Studies, Uncategorized, Visual Culture on April 6, 2015 by Clare Hills-Nova.